Back in the 1970s, Buster opened a restaurant known for its tasty food and friendly service. A few doors down, Dave opened an outrageous place for fun and games for adults. The two young entrepreneurs noticed people rotating between their establishments, and an idea started to form: What if they put both under one roof? 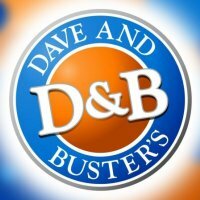 With Dave’s name first because he won a coin toss, they opened the first Dave & Buster’s in December 1982. Since then, more than 80 stores have opened across the country. Today, much has changed. There are more cool games than ever in each store (over $1 million worth), more menu items (we started with one entrée on the menu) and the most innovative drinks anywhere (where else can you get a drink with strawberry-flavored ice cubes?). And now, with the addition of D&B Sports, you can watch the games and play the games. With so many options to choose from, there's something for everyone!